President Ilham Aliyev reacted angrily on Wednesday to the human rights campaign “Sing for Democracy” held during the Eurovision, denounced its organizers and opposition groups. He also accused them of a grand conspiracy to smear Azerbaijan's reputation. Speaking in the Cabinet of Ministers meeting reviewing country's social and economic development for the first half of 2012, President Aliyev branded the activists “traitors to the nation” and “betrayers”, as well as alleged their cooperation with Armenian lobby. In May, Baku hosted the Eurovision Song Contest – an annual music competition held between countries - members of the European Broadcasting Union. Some civil society activists decided to use this opportunity to advocate for more human rights in Azerbaijan. The campaign, called “Sing for Democracy” and human rights situation in the country got a lot of attention from European media and public. Two main opposition groups – the Republican Alternative and the Public Chamber also used the opportunity to draw attention to uneasy political situation in the country. 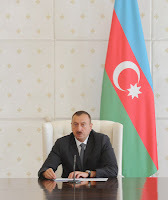 President Aliyev said the campaign was “unexpected” as there were no political issues raised before in the history of Eurovision. He said it was the work of anti-Azerbaijani forces gathered together to smear the reputation of the country. These anti-Azerbaijani forces included – according to President's words – global Armenian lobby, Islamophobic circles in Europe and “third forces who can't tolerate Azerbaijan's achievements and economic development, especially during crisis years." “Local anti-national forces, those who call themselves 'opposition' - not even forces, but elements” also joined this “nasty campaign based on lies and smear”, supported by both international and local press. President Aliyev also accused activists of taking foreign guests out of the city center to show them suburbs that were in unfavorable conditions. “We are strong, because we have people's support. We are also right and the right always wins and we will continue to win,” Aliyev concluded.